The incidence of esophageal adenocarcinoma is increasing in the United States.1 Treatment for localized disease is based on the endoscopic stage, with chemoradiation prior to surgical resection as the standard of care.2 In this case report, we describe the long-term curative outcome of a patient with metastatic adenocarcinoma of the gastroesophageal junction (GEJ) treated with sequential therapies due to an excellent treatment response. A 72-year-old man with a history of chronic obstructive airway disease, diverticulosis, and hypertension presented to his primary care physician with mild dysphagia and acute hematemesis, which prompted endoscopic evaluation. Esophagogastroduodenoscopy (EGD) in April of 2007 showed an ulcerating mass at the GEJ, biopsy positive for adenocarcinoma, with endoscopic ultrasound stage T3N1. Site-specific institutional pathology review showed fragments of invasive, poorly to moderately differentiated adenocarcinoma without signet ring cells arising in Barrett’s mucosa (Figure 1). Immunohistochemical stain was negative for Helicobacter pylori. 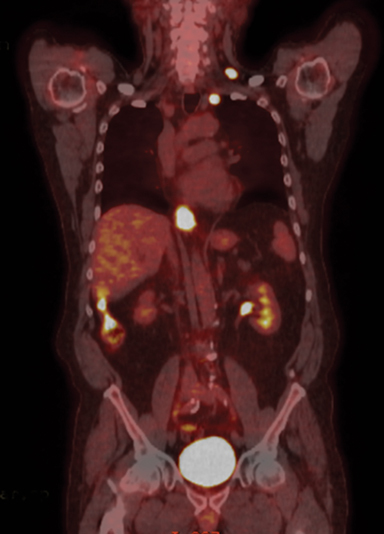 Staging computed tomography (CT) of the chest, abdomen and pelvis did not show evidence of metastatic disease. The patient was seen in a multispecialty evaluation with medical/surgical/radiation oncology and was recommended to undergo neoadjuvant chemoradiation prior to resection. The patient underwent radiation oncology simulation and a treatment planning positron emission tomography/CT (PET/CT) scan in the treatment position. Unexpectedly, the PET/CT scan showed a hypermetabolic left supraclavicular node and a left level 1L node (Figure 2). 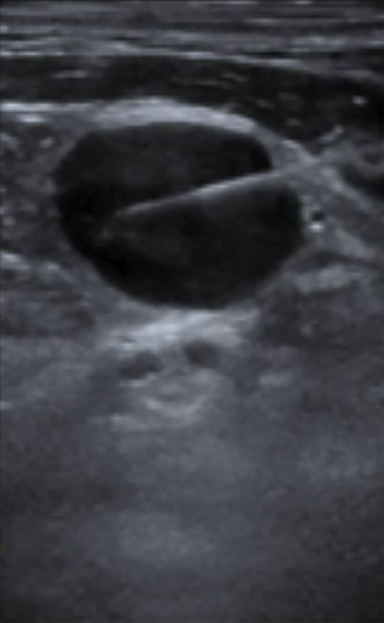 Ultrasound-guided fine-needle aspiration (FNA) of the left supraclavicular node was positive for adenocarcinoma, confirming metastasis (Figure 3). According to the 6th edition of the American Joint Committee on Cancer (AJCC) staging system, which was in place in 2007, involvement of a cervical lymph node station for a distal esophageal primary tumor represented metastatic disease classified as M1b, stage IVB.3 Indeed, the only regional nodes for GEJ primary tumors were lower esophageal (below the azygous vein), diaphragmatic, pericardial, left gastric, and celiac nodes. Standard-of-care treatment for these patients consisted of systemic therapy alone with palliative intent. Although standard treatment was systemic therapy alone, the patient responded so well to cisplatin and irinotecan after 4 cycles that he proceeded to chemoradiation of both the esophageal primary and neck, completing therapy in October 2007. He received a dose of 50.4 Gy to both sites and treatment was delivered with concurrent capecitabine. He continued to do well for the next 4 years, with resolution of his neck disease but persistent esophageal disease for which he received endoscopic mucosal resection, cryoablation and further chemotherapy with carboplatin and paclitaxel in conjunction with trastuzumab antibody therapy. Due to his prior excellent treatment response and stable disease, he was presented again to the tumor board for surgical consideration. By June 2011, the tumor board recommendation after localized GEJ disease only without further systemic progression was surgery, so the patient underwent an Ivor Lewis esophagectomy. Pathology showed a 1.2 cm poorly differentiated adenocarcinoma with tumor midpoint at the GEJ with 15 negative lymph nodes, pathologic stage T3N0. It has now been 11 years since the diagnosis of stage IVB esophageal cancer and the patient remains without any clinical or imaging evidence of disease (Figure 4). 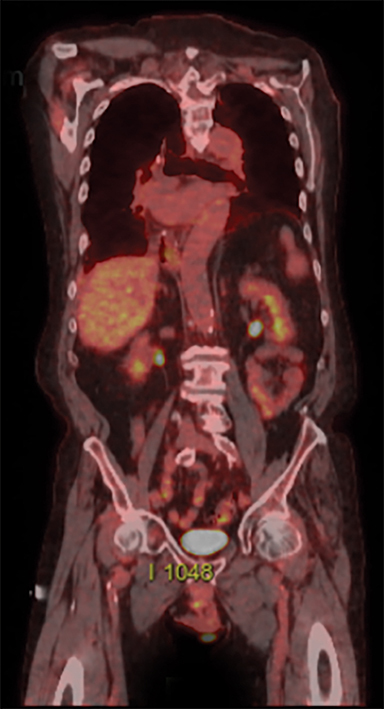 Initial staging CT of the chest, abdomen and pelvis did not show any evidence of metastatic disease. However, PET/CT demonstrated increased F-18 fluorodeoxyglucose (FDG) uptake in a left supraclavicular node and left level 1L node. Repeat PET/CT staging after chemoradiation showed resolution of hypermetabolic left supraclavicular and left superior mediastinal lymph nodes as well as a marked reduction in primary tumor size. The patient’s subsequent imaging studies after esophagectomy, including a PET/CT in November 2017, were negative for disease. 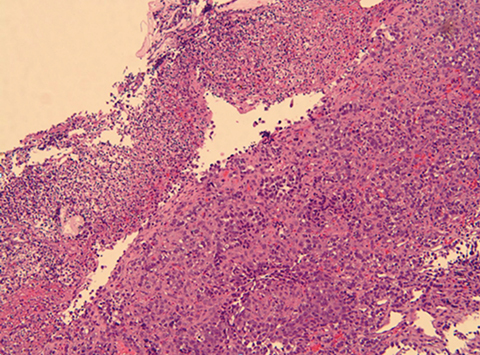 Final pathology from the ultrasound-guided FNA of the left supraclavicular node was positive for adenocarcinoma, confirming metastasis of the distal esophageal primary tumor, thus placing the final diagnosis as M1b, Stage IVB (AJCC 6th edition). After a CT scan of the chest/abdomen/pelvis determined no metastases, initial staging was confirmed by endoscopic ultrasound (EUS) and PET/CT scans. 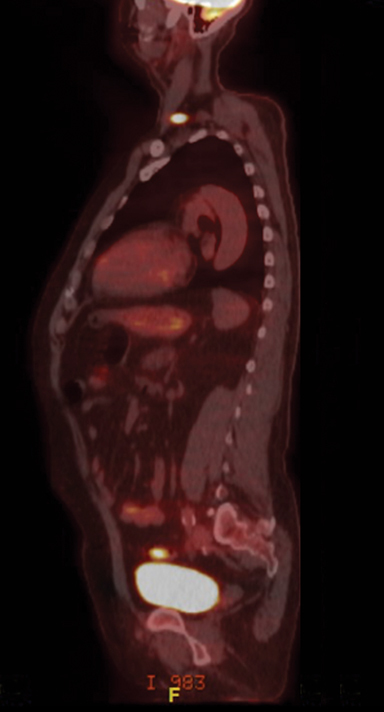 The most distinct role of FDG PET is to detect distant metastasis, as it is shown to be more accurate than CT scans.4 In the classification system of metastasis by the AJCC 6th edition at the time the patient was treated, distant metastasis was divided into M1a and M1b based on the primary tumor location in the esophagus and whether the lymph nodes were considered regional.3 In the case study, the primary tumor location was GEJ with the M1b classification by virtue of a distant left supraclavicular biopsy-proven lymph node. There have been several important changes in the AJCC esophageal cancer staging guidelines since this patient completed treatment. The 7th and most recent 8th edition of AJCC staging guidelines have eliminated the M1a and M1b subcategories for esophageal cancer. Distant metastases are simply designated as M0, no distant metastasis, or M1, distant metastasis.5 Additionally, changes leading up to the 8th edition include redefining cancers originating in the GEJ. While the 6th AJCC edition did not provide definitive anatomic details regarding the GEJ as the primary site, the 8th edition defined adenocarcinomas with epicenters no more than 2 cm into the gastric cardia as esophageal cancer, and those extending further as stomach cancer.6 Additionally, the new 8th edition of the AJCC staging system now classifies the patient’s 1L node as regional but the supraclavicular node would still be metastatic. These findings have implications for radiation therapy contouring delineation for esophageal cancer,7 emphasizing the importance of the primary tumor location and extension into the stomach as well as the extent of regional vs. nonregional lymph node involvement. Recent data suggests there may be an expanded role of local therapies in patients who have a favorable clinical response. In a study reported by Kaya et al, 101 patients at MD Anderson Cancer Center received consolidation local therapy for metastatic esophageal cancer with a 20% 5-year survival rate.8 The majority of these patients (n = 71) had proximal tumors and 30 patients had distal tumors. Overall survival was highly associated with location, with a median survival of 22.8 months for proximal tumors vs. 41.5 months for more distal tumors (p = .03). This data suggests that further study of stage IV patients may be indicated to optimally select patients for this approach. Over the past several decades, clinical guidelines have increasingly become an integral part of oncology practice. As outlined by the Institute of Medicine, clinical guidelines are “systematically developed statements to assist practitioner and patient decisions about appropriate health care for specific clinical circumstance.”9 Clinical guidelines established upon evidence-based medicine improve the consistency of care and the quality of clinical decisions.10 In certain instances, however, there can be potential benefits to developing a treatment strategy tailored to a specific patient. This case exemplifies the opportunity and impact of a personalized approach to cancer care—one that deviates from established clinical pathways. Despite the initial metastatic diagnosis, the patient’s excellent treatment response gave pause to the standard clinical treatment plan, which led to the consideration of curative surgery. By evaluating the full context of the patient’s disease and response, an individualized approach produced an unexpected cure. The role of multimodality local therapy inclusion for stage IV esophageal patients, particularly with distal tumor location, may be appropriate based on treatment response. Individualized variations to standardized treatment guidelines may apply to patients who have an excellent response to therapy, highlighting the potential for long-term cure. Coleman HG, Xie SH, Lagergren J. The epidemiology of esophageal adenocarcinoma. Gastroenterology. 2018;154(2):390-405.
van Hagen P, Hulshof MC, van Lanschot JJ, et al. Preoperative chemoradiotherapy for esophageal or junctional cancer. N Engl J Med. 2012;366(22):2074-2084. Greene FL, Page DL, Fleming ID, et al, eds. AJCC Cancer Staging Manual. 6th ed. New York: Springer‐Verlag; 2002. Flanagan FL, Dehdashti F, Siegel B, et al. Staging of esophageal cancer with 18F-fluorodeoxyglucose positron emission tomography. AJR Am J Roentgenol. 1997;168(2):417-424. Rice TW, Blackstone EH, Rusch VW. 7th edition of the AJCC Cancer Staging Manual: esophagus and esophagogastric junction. Ann Surg Oncol. 2010;17(7):1721-1724. Amin MB, Edge SB, Greene FL, et al, eds. AJCC Cancer Staging Manual. 8th ed. New York: Springer; 2017. Wu AJ, Bosch WR, Chang DT, et al. Expert consensus contouring guidelines for intensity modulated radiation therapy in esophageal and gastroesophageal junction cancer. Int J Radiat Oncol Biol Phys. 2015;92(4):911-920. Mizrak Kaya D, Wang X, Harada K, et al. 101 long-term survivors who had metastatic gastroesophageal cancer and received local consolidative therapy. Oncology. 2017;93(4):243-248. Field MJ, Lohr KN, Lohr KN, eds. Institute of Medicine Committee to Advise the Public Health Service on Clinical Practice Guidelines, Clinical practice guidelines directions for a new program. Washington DC: National Academies Press; 1990. Woolf SH, Grol R, Hutchinson A, Eccles M, Grimshaw J. Clinical guidelines: potential benefits, limitations, and harms of clinical guidelines. BMJ. 1999;318(7182):527-530. Song EY, Parikh N, Frakes JM, Harrison LB, Hoffe SE. Long-term cure of stage IVB esophageal adenocarcinoma. Appl Rad Oncol. 2018;7(3):40-43. Mr. Song is a first-year medical student at University of South Florida (USF) Morsani College of Medicine. Dr. Parikh is an interventional radiologist, Dr. Frakes is a radiation oncologist, Dr. Harrison is the deputy physician-in-chief and chair, Department of Radiation Oncology, and Dr. Hoffe is the section head of gastrointestinal radiation oncology at Moffitt Cancer Center, Tampa, FL. Disclosure: The authors have no conflicts of interest to disclose. None of the authors received outside funding for the production of this original manuscript. Portions of this case were presented at the 2018 FMA David A. Paulus Poster Symposium, August 8, in Orlando, FL.